Andrew Dean received a Rhodes Scholarship in November 2011, after completing a B. A. (Hons) in English at the University of Canterbury. Read more about his transformative experience. I began at Oxford in October 2012 and I read for a one year masters in 20th Century Literature; from 2013–2017 I read for a doctorate in English, focusing on post-1945 fiction. The scholarship has been a transformative experience for me. My masters course opened my intellectual horizons. During the doctoral thesis, I have been supervised and examined by a number of remarkable scholars. It has been with the support of the scholarship, too, that I’ve had the time and funding to write in a more public way about literature and politics. 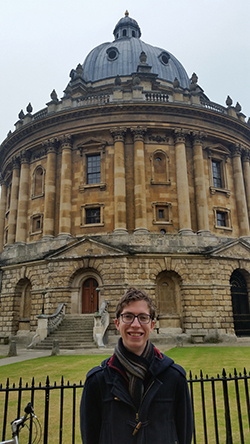 Rhodes Scholars have many different experiences coming into their time at Oxford, and take many different paths through their time there. It is unusual in that it offers support to undertake almost any course, from a second BA to a doctoral thesis. Rhodes House itself endeavours to create a community of scholars from all over the world. I couldn’t have asked for a more stimulating environment in which to study and work. Interested in applying? The closing date for applications is 1 August so start thinking and preparing now. Click here for more information. Andrew in front of the Radcliffe Camera (a library) in Oxford. Up to three graduates are selected from New Zealand each year. To be eligible they must be either residents or citizens, have spent at least five of the previous ten years in New Zealand, and aged between 19 and of 25. Read more about eligibility here. Globally a total of up to 95 scholars are selected from Australia, Bermuda, Canada, China, Germany, Hong Kong, India, Jamaica & the Commonwealth Caribbean, Kenya, Malaysia, Pakistan, Southern Africa (including South Africa, Botswana, Lesotho, Malawi, Namibia and Swaziland), SJLP (including Syria, Jordan, Lebanon, Palestine), United Arab Emirates, United States, West Africa(from 2018), Zambia and Zimbabwe as well as New Zealand. Do you have the intellect, character, leadership, and commitment to service, to carry out postgraduate study at the prestigious University of Oxford, UK? Come to the Rhodes Scholarship Information Evening and find out if you’ve got what it takes to join the illustrious list of successful New Zealanders who have won Rhodes Scholarships.The Rhodes Scholarships are postgraduate awards supporting outstanding all-round students at the University of Oxford and providing transformative opportunities for exceptional individuals. The Rhodes scholarship is recognised worldwide and Rhodes scholars have been and will continue to be leaders on the national and international stage. The University of Canterbury has a long history of Rhodes success: our first Rhodes was awarded in 1915 and since 2011 we have had six Rhodes scholars elected. Register for the free evening now. Te Rūnanga o Ngāi Tahu in conjunction with the UC’s Ngāi Tahu Research Centre, Office of the Assistant Vice-Chancellor Māori and the University of Otago is pleased to announce its participation in the First Nations’ Futures Programme (FNFP) in 2017. 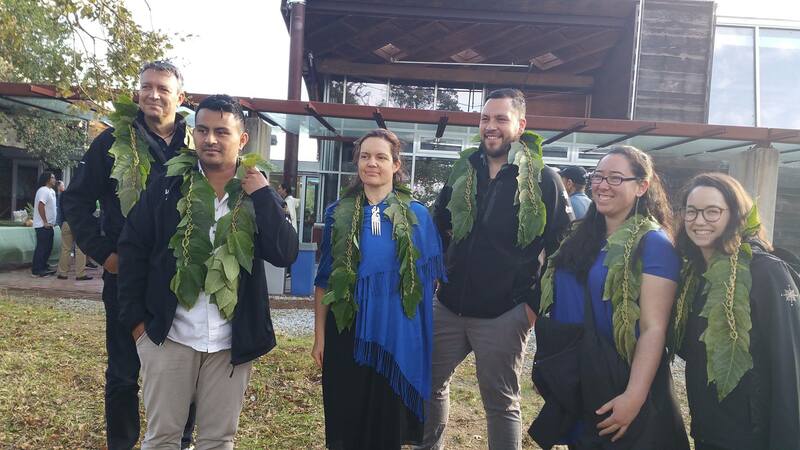 The First Nations’ Futures Programme provides an unrivalled opportunity for aspiring Ngāi Tahu leaders and other Māori postgraduate students to gain access to leading international research and thinking within a uniquely indigenous context. Applications are also invited from Ngāi Tahu and other Māori undergraduate students who are close to completion of their degree and who intend to apply for postgraduate study in 2017-2018. 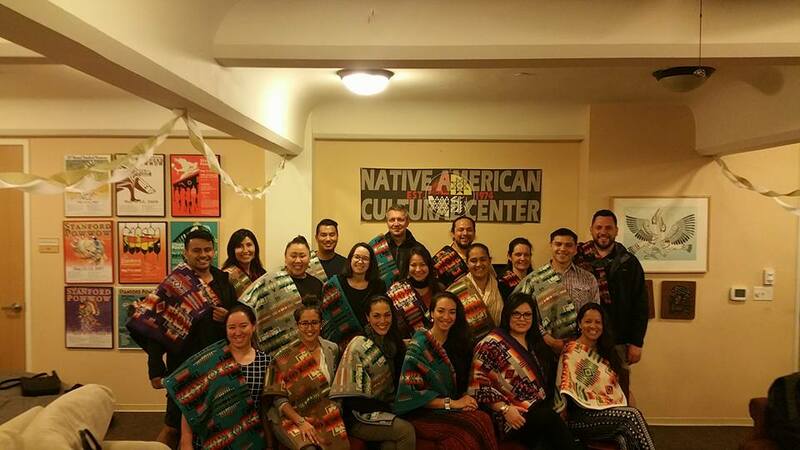 The First Nations’ Futures Programme is held at Stanford University for two weeks in October/November every year. The closing date for expressions of interest is 19 May, 2017. Please note: applications for 2017 will be available online from Friday 7th April.